We’ve all seen a huge explosion of startups within the commercial real estate technology space. It’s not a coincidence but rather a huge opportunity that many bright people are looking to exploit. Entrepreneurs who are familiar with the inner workings of the commercial real estate industry have struck a gold mine. We all know that the industry, which is essentially run by people over 50, is ripe for innovation and disruption. Angel investors, VC’s, and even long-standing incumbents are looking to profit from the opportunity. The most well-known of the bunch is MetaProp NYC. 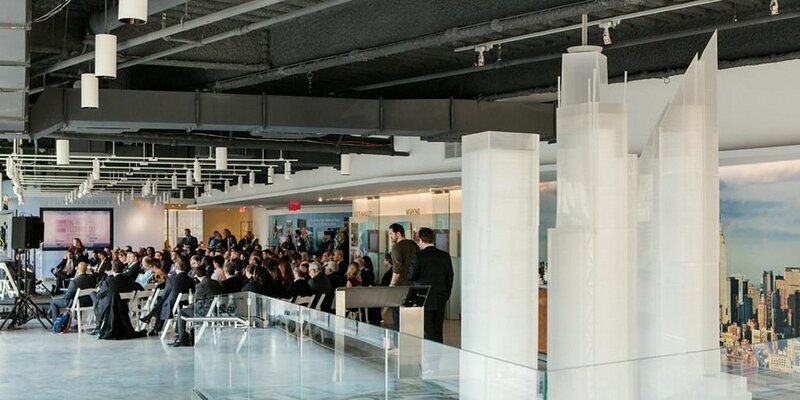 It has a huge network of mentors; some of the biggest names in CRE Tech. It’s a 22 week program where your company will initially be funded with $25,000 investment in exchange for a 6 percent equity stake. There is an opportunity to get up to $250,000 in pre-seed and seed stage funding. A few of their investors include: Accel Partners, Andreesen Horowitz, Sequoia to name a few. 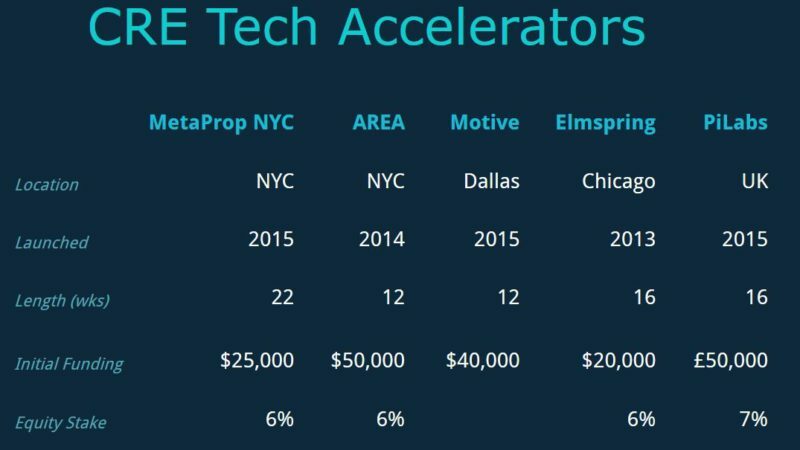 This accelerator was actually started in 2014, but didn’t make much of an impact until after MetaProp NYC had launched. It was founded by the legendary David Rose. Providing $50,00 in seed capital, AREA dishes out more than any other CRE Accelerator. It’s a 12 week program located in NYC. Motive, located in Dallas, was launched in 2015 and had one class. The accelerator initially raised $2 million to fund the program, but has since put the program on standby. They accepted 4 companies to the program in 2015. Hopefully we see this program turn things around. Based in Chicago, this 3 months program provides accepted companies a $20,000 investment plus $6,000 in credits from a Chicago Law Firm in exchange for a 6% equity stake. They will be accepting applications for their fourth cohort in December 2016. This UK based real estate accelerator is the first to launch in Europe. They plan to create a £500,000 fund to invest in 15 startups over an 18 month period. It’s a 2 month program that provides selected companies with an in initial investment of £50,000 in exchange for a 7% equity stake. For more established companies, PiLabs has created a second option that gives them the right to a acquire up to 5% (on a fully diluted basis) of the equity of the next round of funding. This Chicago based company is better known as an early stage venture fund than an accelerator. They have recently added the accelerator to their business model focusing on startups within the real estate, insurance, mortgage, finance and home services industries. The companies selected do not co-locate; however, they do meet monthly at industry events. Seeing accelerators pop up all over the country is great news for entrepreneurs. I’m sure a variety of additional accelerators will enter the market. I would love to see a few pop up on the West Coast. Despite the number of accelerators in the Bay Area, I’m sure there is a strong enough demand for one focused on real estate. Who’s going to make that happen?